Let's see if we can squeeze a couple samples in today. This one is Pouch #1. Sold - Thanks! This is a pretty pink cotton fabric. This print makes me happy. I'm glad I have a lot of it to satisfy my bottomless pit of fabric need/want/greed. The lining is an off-white with turquoise dots. 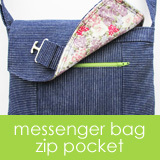 The pouch is lightly padded with fleece and closes with antique silver snaps. I had to move one of the studs. You can see the small holes in the fabric around the stud on the left. This was before I learned to apply the studs one at a time (read about it here in #4). This is $8 and includes shipping. It is available in the US only. Use the PayPal button below to order. There is just one available, so if you get a sold out message it is gone. Here is the last sample for today. Sold - Thanks! It is the Long Pouch from this pattern. This is a good one for storing scissors, rotarty cutters, pens, and other tools. There is still plenty of room left over for a slim wallet, keys, etc. It is lightly padded with fleece and closes with black snaps. This is $12 and includes shipping. It is available in the US only. Use the PayPal button below to order. There is just one available, so if you get a sold out message it is gone. The next sample is another Pouch #2. Sold - Thanks! The fabric is another print from Bonnie & Camille for Moda. It such a beautiful blue color and is just a lovely print. 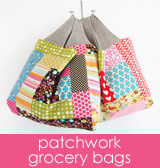 I think I only bought one yard and now I want more to make some grocery bags. It is lightly padded with fleece and closes with antique silver snaps. This is $9 and includes shipping. It is available in the US only. Use the PayPal button below to order. There is just one available, so if you get a sold out message it is gone. 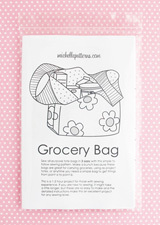 The next sample is the Little Pouch from this pattern. Sold - Thanks! This is a cute little thing! It's perfect for a phone and a few other small items. The fabric is from Yuwa, but I don't know the name of this print. This is $10 and includes shipping. It is available in the US only. Use the PayPal button below to order. There is just one available, so if you get a sold out message it is gone. Things are stacking up around here, so let's do some samples today. This first one is Pouch #2 from the special this week. Sold - Thanks! The exterior fabric is from the "Oh Deer" collection by Momo for Moda. The lining is white with with red dots. It is lightly padded with fusible fleece and closes with a set of shiny red snaps. It is $9 and includes shipping. This is available in the US only. Use the PayPal button below to order. There is only one available, so if you get a sold out message someone else has claimed it already.